Selling your services to big corporations is an attractive proposition. The contracts are larger than with small businesses and individuals, and often longer-term. There's the possibility of repeat business worth many billable hours at respectable rates. Many refer to this now as Account Based Marketing (ABM). But the best clients are not always the easiest to get. If you don't grasp the realities of the corporate environment, you may sabotage even a hot lead. Here are five selling strategies to working with the corporate buyer. Busy managers ignore unsolicited email, and don't return calls. Even when you are in the final stages of closing a deal, your contact may not return your calls for weeks. If you accept this as normal behavior instead of obsessing about how you may have caused it, you will sleep better at night and use your daylight hours more productively. If you want to capture the interest of a busy person, you need to tell them exactly how you can help them. What do the people in your target market perceive to be the most urgent problems they face, or the immediate goals they need to achieve? Ask these questions of the people you serve and the other business people who serve them. Read trade literature or special interest publications and educate yourself on the key issues in your marketplace. Then tell your prospects in every communication how you can help address these needs better than anyone else. Large organizations make decisions by committee. 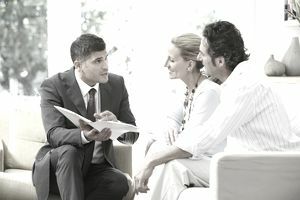 There are many executives who participate in this "buying center", and each has a unique responsibility. Purchasing may be responsible for the "deal", while engineering may be responsible for testing. Find out who is on the team. Traditional thinking says there will be at least three: the economic buyer, the technical buyer, the end-user. If you want your sale to go through, you need to provide each of these contacts with evidence, from their point of view, why you and your solution are the best choice. When you provide your evidence, it better include dollars and cents. If you are more expensive than your competition, what added value will you provide? What tangible benefits will they receive that make the added expense worthwhile? A good selling strategy is to provide real-life examples of results at other companies. Illustrations with charts and graphs are more convincing than any brochure. No deal will go through if there's no money in the budget. Always ask if the client has a budget at the first meeting. Don't necessarily expect them to tell you how much it is -- price negotiations will come later. But if your contact can't answer budget questions, it's a strong clue you are not talking to the decision-maker. C.J. Hayden is the author of Get Clients NOW! Since 1992, C.J. has been teaching business owners to make more money with less effort. She is a Master Certified Coach and workshop leader.